Clyde Reed is a frequent musical collaborator with Kate on her poetry readings. Clyde is a creative music bass stalwart of the Vancouver B.C. scene and (until recently retiring) an economics professor at Simon Fraser University . He is one of the founders of the NOW Orchestra and has performed with Barry Guy, Leo Smith, George Lewis, Bobby Bradford, Rob Blakeslee, Vinny Golia, Peter Brotzmann and many leading Canadian musicians. He is regularly invited to international jazz festivals and has performed at the Vancouver Jazz Festival, Toronto Jazz Festival, Ottawa Jazz Festival, Chicago Jazz Festival, Penofin Jazz Festival (California), Bumber Shoot Festival (Seattle), Earshot Jazz Festival (Seattle), Berlin Jazz Festival and the Lisbon Jazz Festival. Clyde’s early musical training was in classical piano. In 6th grade he began a jazz drumming phase that continued through high school. Throughout that time he performed in coffee houses in Portland, Oregon. Motivated in part by the angst of graduate school in Economics, he returned to piano in university, studying jazz piano and theory with Jerry Gray at Cornish College of the Arts in Seattle . His bass studies began around 1970 with classical teachers who included Ron Simon (Seattle Symphony), Milan Hurt (Vancouver Symphony) and Peter Rofe (San Diego Symphony, currently with Los Angeles Philharmonic). 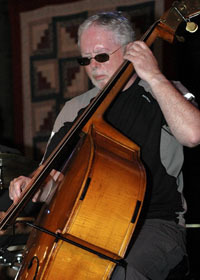 He has had master classes with jazz greats Ray Brown, Charlie Haden, Gary Peacock, and Dave Holland and has long-term musical relationships with Bobby Bradford, Rob Blakeslee, Jared Burrows, Coat Cooke, Bruce Freedman, Vinny Golia, Rich Halley, George Lewis, Paul Plimley, Claude Ranger, Dylan van der Schyffe, Gregg Simpson, Stan Taylor, among others. He has worked in cross-disciplinary collaboration with poets Kate Braid , Gerry Gilbert, Laura Winters, Robert Creeley and Jamie Lamb, and with EDAM dance company. You can listen to some of Kate’s collaborations with Clyde on this web site, at the links below.